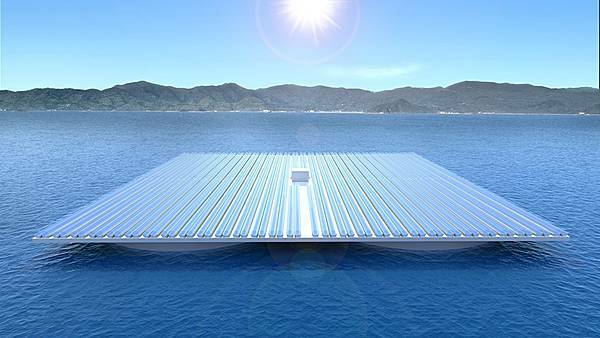 The platform design developed by Heliofloat has the particularity that it offers a lightweight design which still can be fabricated locally in emerging economies, that it offers by far the best resistance to waves during storms and that it allows for high humidity zones at the water surface and hence lowest possible evaporation rate. HELIOFLOAT offshore platforms are built and engineered for the special needs of offshore solar power production. Our platforms are based on a patented pressure based skirt system which is connected through a light weight structure. The flexible membrane and the air cushion reduce the wave excitation to a minimum. These two features minimize the material input and maximize the stability against waves and weather. Despite its little weight (from 5-50 kg/squaremeter) the constuction enables an actual load of up to 100kg/square meter. Using platforms for offshore applications enables the construction company as well as the operator to finish all construction work in the harbour or near the coast. After completion, the platform will be pulled out into the sea to its final destination. There, the supporting air chambers are filled with a blower to lift the platform 10 to 15 meters above sea level. HELIOFLOAT platforms are scalable and can reach a side length of three hundred meters. As collateral security conventional buoys are fixed on the bottom of the platforms. HELIOFLOAT platforms are engineered to withstand all weather conditions and will not sink even in case of complete power loss. A platform can be tracked around a vertical axis either by employing propellers, or - in regions with sufficiently strong sea currents - the rotation can also be induced by rudders. That is how the ideal angle of invidence is assured. 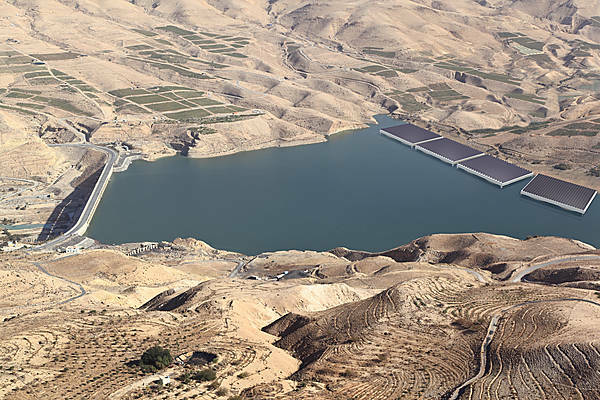 Another advantage is the endless amount of cooling water, one of the main benefits compared to land based (desert) plants. This is the bottom seight of a HELIOFLOAT platform. 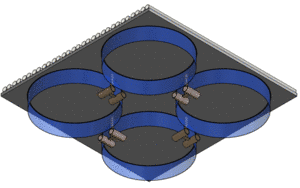 The four supporting cylindrical membrane skirts (which have a diameter of about 25 meters on a 60x60 platform) can be seen.